Surprise! 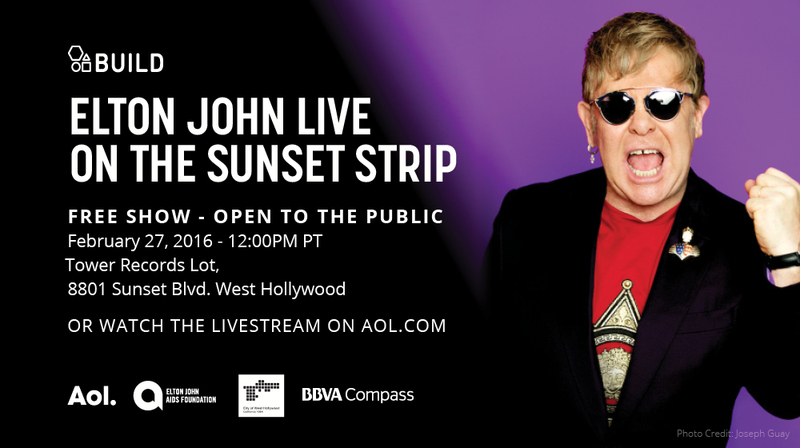 Elton John is treating fans to a special concert on February 27th, and we can't wait! The performance will stream live on AOL.com at 12pm PST /3pm EST for fans to enjoy around the world. For those of you looking to catch the show in person, the free 60-minute performance will take place on Sunset Blvd. in front of the old Tower Records, a longtime favorite destination for the singer. The concert is a show of thanks to the city of West Hollywood for their continued support of the Elton John AIDS Foundation and its Academy Awards Viewing Party over many years. The show is co-presented by AOL BUILD and BBVA Compass bank. Elton will play a jam-packed set of his classic hits, including "Crocodile Rock," "Tiny Dancer," "Rocket Man," "Candle In The Wind" and "Your Song," as well as new favorites from his newly released album "Wonderful Crazy Night." The Elton John AIDS Foundation (EJAF) will present its 24th annual Academy Awards® Viewing Party Wonderful Crazy Night on Sunday, February 28, 2016, at West Hollywood Park in Los Angeles. Elton John and David Furnish will host the gala event. At EJAF, we believe that AIDS can be beaten. We act on that belief by raising funds for evidence-based programs and policies, and also by speaking out with honesty and compassion about the realities of people's lives. Elton John created EJAF over twenty years ago, first in the United States in 1992 and then in the United Kingdom in 1993. Through hard work and with the help of our network of kind and generous friends and supporters, the two foundations together have raised more than $349 million over the past two decades to combat stigma, prevent infections, provide treatment and services, and motivate governments to end AIDS. The U.S. foundation focuses its efforts on programs in the United States, the Americas, and the Caribbean, while the U.K. foundation funds HIV-related work in Europe, Asia, and Africa. Join us in speaking out, taking action, and contributing to our efforts to achieve a world without AIDS. For more information, please visit www.ejaf.org.